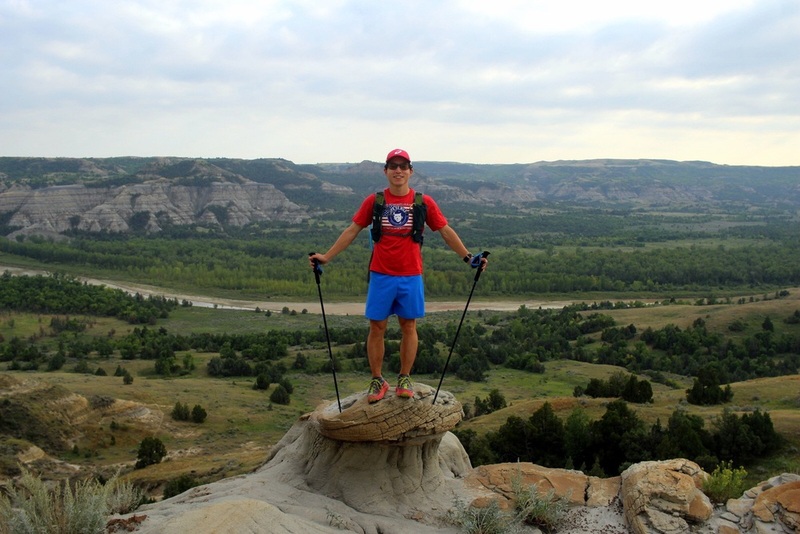 My first big run--in Theodore Roosevelt National Park--didn't go as planned. I got lost in the backcountry. And the NPS rangers helped me get out. Let me explain. My original plan was to tackle the Achenbach Trail, a challenging 18-mile loop in a remote area of the park. On the 2.5-hour drive from Bismarck to the park's North Unit, however, the sky looked ominous. I'd checked, and the weather forecast called for thunderstorms. If that were the case, I simply didn't want to risk being backcountry by myself on such a challenging trail. The sky wasn't ominous all day. A double rainbow. When I arrived at the visitor center, the ranger confirmed my intuition. He recommended against running the Achenbach. Not only did it require two river crossings, which could get dangerously high in storm conditions, but it also had a significant amount of bentonite clay. I didn't quite understand the physical properties of this clay, but apparently when it gets wet, it is so slick that it feels like an ice skating rink. If I were to go on the Achenbach and it rained, I would risk being stuck in an extremely remote area with a very treacherous trail. There was absolutely no question what I was going to do: anything but the Achenbach. I know that safety came first. I'm a greenhorn when it comes to backcountry navigation. I wasn't going to risk anything, especially on my first day doing a serious run. I've also been following the principle of building up gradually, so I knew that I wanted to do something simpler first. 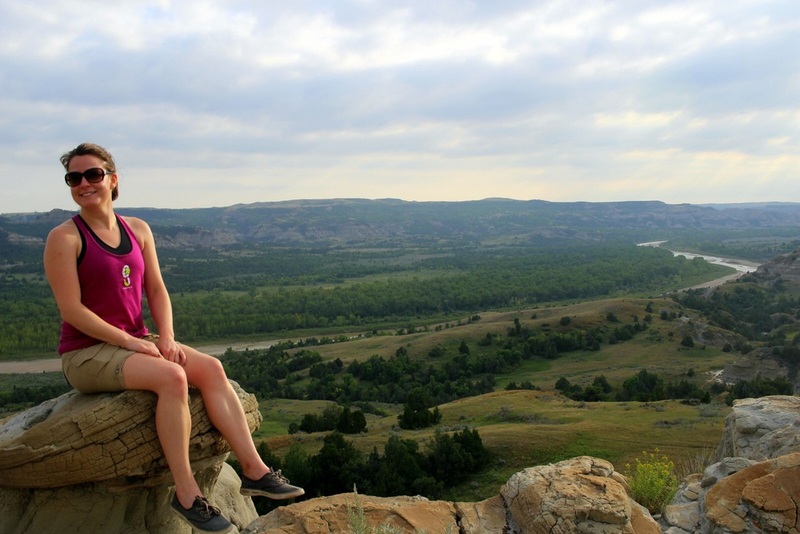 The ranger suggested the Buckhorn Trail, an 11.2-mile loop that covered most of the park and included a couple prairie dog towns, and possibly also the Caprock Coulee Trail, a short 4.5-mile loop that covered some of the best vistas in the park. I opted to do both, and I decided to begin with the Buckhorn. Because the Buckhorn began in a very narrow patch of land between the park's main road and the Little Missouri River, I wasn't too worried about going off-trail. As long as I kept the road to the north, and the river to the south, of me, I knew that I'd be fine just generally proceeding east. As a result, the first 4 miles or so were of no real concern. I took time to explore the ecosystem where the buckhorn used to roam. I marveled at the sedimentary layers of the badlands buttes--the patterns are so naturally pleasing. I also noticed ubiquitous evidence that bison were around--fresh bison poop. 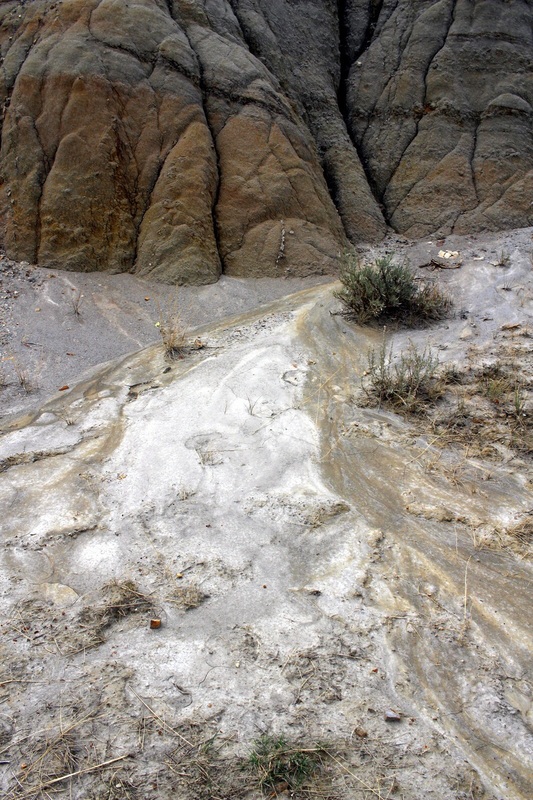 And I found patches of bentonite clay, which I could easily envision getting extremely slick when wet. Eventually, I popped back over the main road to the beginning of the backcountry portion of the Buckhorn Trail. I still felt very comfortable, and let myself push up a narrow trail as it ascended gradually. I passed through a wooded area, before reaching my first scenic point. It was amazing to take everything in from high up above. After about 2 hours and 8 miles, I had ascended way up above the buttes and had come out onto a grassy prairie. Imagine a grassy field that extended into the horizon along 270 degrees. I continued following the trail posts until--well, until I could no longer see either where the trail continued or the next trail post. At this point, I took out my map and compass to assess the situation. Several times, I ventured out before backtracking, realizing I'd not gone down the right trail. When I came back to the original post, I noticed that a trail continued back down the buttes. I followed that trail, dropping back down into the valley. Then, oddly, I passed 3 water troughs and a fenced section. I suspected that this was not part of the main trail and that I'd come across some kind of service or maintenance area (I later learned these troughs were for the bison). I continued anyways. Eventually, I found myself descending quickly again, and the views, again, were incredible. WAIT. This view was almost exactly as incredible as the one I'd already seen. And then it hit me: I was going in reverse down the trail I had originally come up. At this point, I panicked a tad. 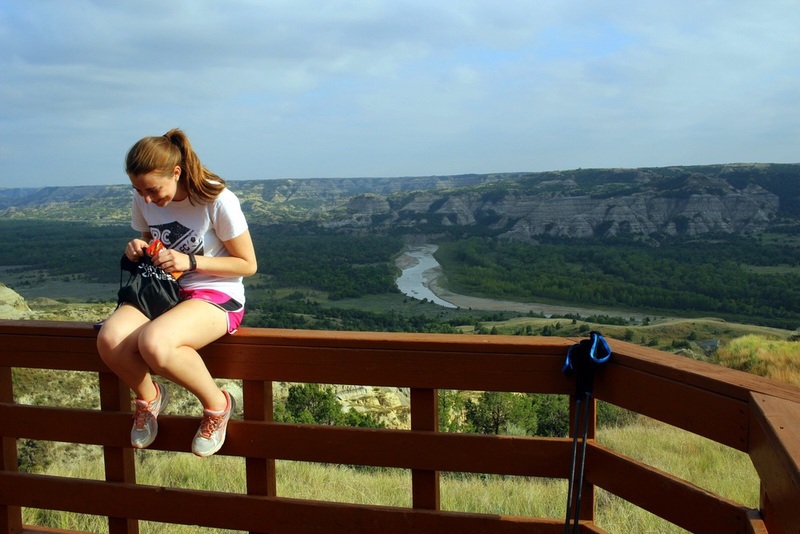 My legs were fresh, I had lots of water and food, and I even had cell service high up on the prairie, but I just felt uneasy knowing that I'd somehow U-turned without even realizing it. Making this kind of mistake once would be fine. But if I kept doing this, I could get stuck out here. I took out my compass and figured out which general direction I needed to follow. I quickly realized that my original direction was correct. But I still couldn't, for the life of me, explain why I had done a loop and ended up retracing my steps. I knew I had to go out onto the prairie so I continued back in the original direction again, more determined than ever to find the right trail. Again, this proved extremely difficult. Every time I found a post, I could find no clear trail. Any time I thought I'd found a clear trail, I'd follow it for a few hundred yards and then it would disappear into tall prairie grass. I knew it couldn't be the case that the trail would take us into such tall grass. So I'd retrace my steps and try again. This was a labyrinth game, except I was criss-crossing the prairie. Following one of these paths, I noticed a prairie dog town on my right. I thought I could use the town to reorient myself, because the map noted two such towns. But when I looked at the map, I realized that both towns were supposed be on my left. This town was on my right. How? Again, I was utterly perplexed. Meanwhile, the prairie dogs just sat there, yapping away with their mating calls and poking their heads out every now and then to taunt me. At this point, I'd spent almost an hour in the exact same spot venturing out on various trails, realizing that they were false, and then returning to my starting point. I still had plenty of water, and it was a cool, overcast day, but I knew I didn't want to do this all day. Realizing that I had cell signal, I decided to call the ranger station. The ranger I'd spoken to earlier got on the line. He tried to determine where I was and helped walk me through my route. With his help, I realized where I'd gone wrong. Past one of the posts, there was a very faint trail in some brush that I was supposed to follow. This trail was much more faint than the two other "trails" I'd attempted to follow. Those trails were created by bison. But now that he mentioned it, I could see that this was a trail nonetheless. I thanked the ranger, hung up, and pushed onward. I reached the next post a few hundred yards away. But, again, the trail seemed to disappear. And, the only things crisscrossing the post were trails that went in the wrong direction relative to where I knew was supposed to be going. I strongly suspected that it was going in the wrong direction, but one trail was so clearly stamped down that I figured it must be the right one. I followed it, again breaking into a fast clip across the flat prairie. I crossed over a dry stream bed and, within minutes, found myself at the park's fence. I was at the boundary. Beyond, I could see the highway. I knew I was supposed to come close to the northern border, but I didn't think I'd actually hit the border. I again called up the ranger station. He said I shouldn't be at the fence, even though it was possible to see the fence from the trail. After trying to figure things out, he said that I should just wait there. He'd send a ranger to meet me. 15 minutes later, I saw a white truck cruising on a road in the distance toward me. It was a ranger. Given the difficulties I'd been having, he suggested I just cut my losses and hop back in with him. I wasn't out here to prove anything. And, more than anything, I was sick of wasting time tracking the trail, and wanted to get back onto a different part of the park. So I hopped in. Back inside the park, I met with the head ranger, John Heiser (he's been at this park for 42 years!). He wanted to know where things had gone wrong. I sheepishly waited for him to scold me. Interestingly, he was very friendly and understanding about the situation, and did no scolding of any sort. He just wanted to get the facts, walk through what happened, and provide tips for future runs. He was like a military commander doing a post-mortem analysis. I explained everything that had happened and he nodded along with me. He pointed out how tough it was to navigate this trail. This park is one of the least-visited, and some of these backcountry trails get very limited use. So the trails are already incredibly faint due to the lack of consistent human foot traffic. To make matters worse, the bison, as already noted, create their own trails--ones that are indistinguishable from, and oftentimes even more real-looking than, the actual trail. Heavy summer rains that had led to overgrown grass didn't help with trail post visibility. All in all, he commended me for cutting my losses and calling the ranger station for guidance, instead of pressing on when I knew something was off. John also explained good trail selection practice. He said that, in every new park I visited, I should always start off by "testing" an easy trail to "get a feel for the land." Every ecosystem had unique challenges. And those challenges couldn't be taken lightly. Here, the challenge was the misleading bison trails and the very faint actual trail (also, in wet conditions, the bentonite clay). Other parks would have their own challenges, and it was better to try them out first before pushing out too far. After this mini-lesson, I told John how demoralized and discouraged I'd now become. This was meant to be my first epic run. And it had ended somewhat miserably, and in failure. To be clear, at no point was I in panic mode. I had plenty of food and water, and also knew that I could reverse course and return to the main road the way I'd come in. But it was disconcerting that I was unable to complete what was already my "second-choice" trail. More importantly, if I couldn't do this, how could I continue to do some of the other trails I've selected in other parks? John disagreed with my dour assessment. He noted how smart I'd been in using my compass, in trying to retrace my steps, and, ultimately, in calling NPS. He also made it clear that this would be the hardest trail to follow, by far, in the national parks I was visiting. The bison create such incredibly realistic trails, that it's practically impossible not to get lost up here. He asked where I was going next, and he nodded along--all of the trails in those parks would be infinitely easier to follow. After this 20-minute debriefing, John suggested I continue with the Caprock Coulee Trail anyways. He said it was nowhere near as difficult to follow, and that I should be able to do it no problem. And the vista had spectacular views that I couldn't miss. It was still the early afternoon, so I figured why not. Perhaps this could lift my spirits, and my self-confidence, after the Buckhorn Trail mishap. I thanked all of the rangers I spoke to, and drove over to the trailhead for Caprock Coulee. As I was about to set off onto the trail, John's truck pulled into the lot. He told me again not to worry about what had happened earlier and to have fun out there. I thanked him again and was about to set off when another car pulled in, and a trio of women popped out. Before I could leave, John told them about my earlier mishap, and joked about how they shouldn't follow me. That was funny. I said hello to the trio and set off. 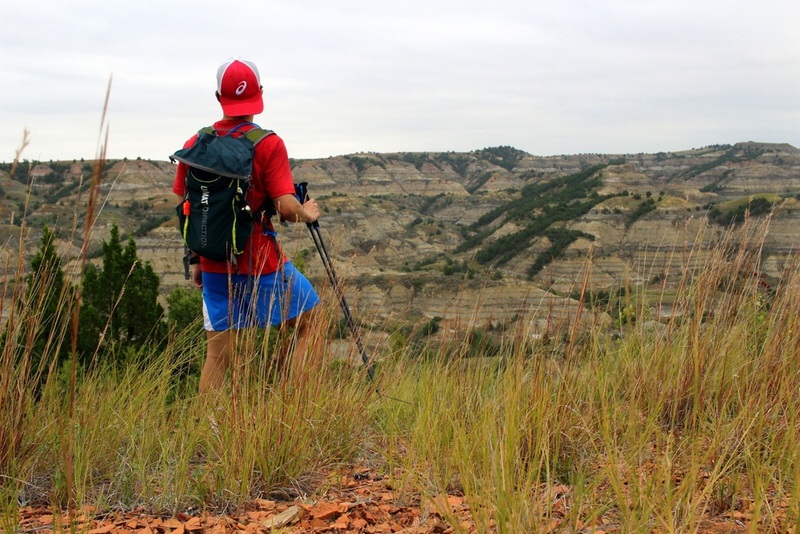 The Caprock Coulee Trail began with a gradual ascent. I didn't want my heart rate to go too high, so I kept it easy. Right as I was reentering my running groove, I noticed movement in the corner of my eye. 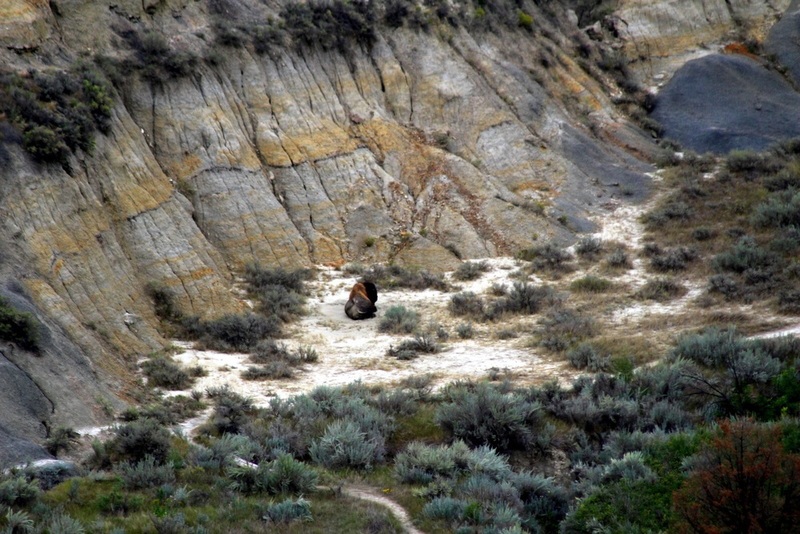 There, a hundred yards away, was a bison, standing watch over the trail (like the troll guarding the bridge from that one fairytale). The bison watching over the path. I immediately stopped and walked backwards away from the bison. I knew how dangerous bison were--I'd heard about the people who'd been killed this summer from trying to take selfies with them--and the rangers had noted that they have a top speed of 30 mph and can jump over 6-foot fences. I knew this beast was not worth messing with. So, from afar, I took photos. Here, he was cleaning off some dirt (even though it looks like he's stomping). I waited 15 minutes, and he was still standing there, staring me down. Eventually, the trio of women caught up with me. After waiting several more minutes together, we decided we'd try to climb up the hill and around the bison. We scrambled up some dusty section, traversed 50 feet above the bison, and then descended behind him. We had successfully navigated around a bison! At this point, I felt like my run had been foiled again. I simply was no longer in the mood to run. 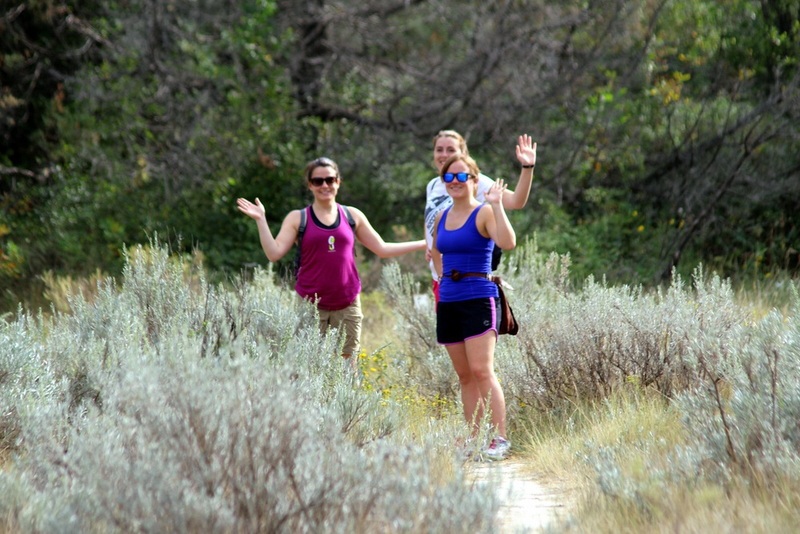 Also, the ladies were good company, so I decided I'd hike with them for the remainder of the loop. The bison in our rear view mirror. I'm glad I continued, and with them. We climbed up and up and reached some spectacular ridges. At one point, we looked back down and saw that the bison was still exactly where we'd left it. The bison is ruler of this kingdom. The views only got more spectacular. I took the women's photos, and they took mine. We eventually reached the River Bend Outlook. This, too, was impressive. We munched on some snacks, took some more photos, and expressed our love for the park. We then proceeded to finish the trail. River Bend Outlook. Too bad it was overcast. 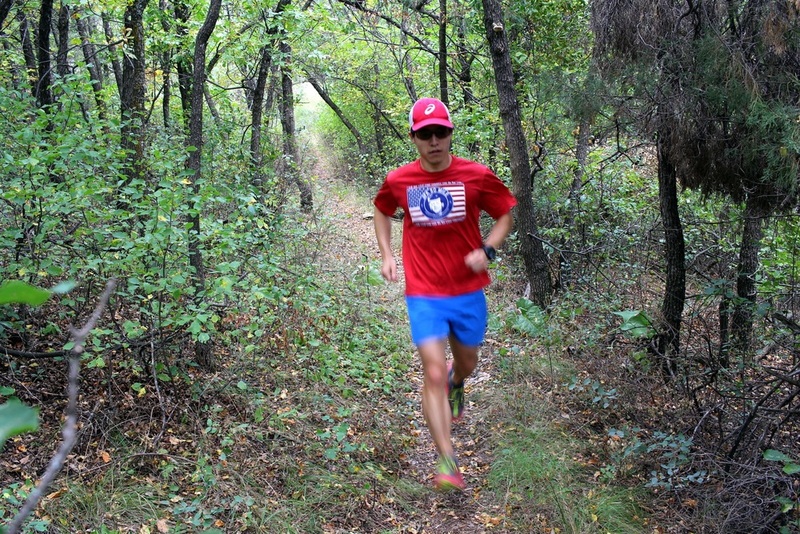 I'd spent from roughly 11:30 a.m. to 6:00 p.m. out on the trails in one form or another. I'd only covered 15 miles or so, but those were very slow, hard miles. Despite the hitches, it was a great day. It was also an important learning day. I learned that I really can't underestimate the wilderness. All of my fitness means nothing if I get lost. Going forward, I'm going to be even more inquisitive at visitor centers to make sure I'm equipped with all the knowledge I need to know to navigate the unique aspects of each park. I'll take each day as an opportunity to become an even better outdoorsperson. And I'll continue running wild and free, with and alongside buffalo. I had a peaceful evening in a campsite in a juniper forest. 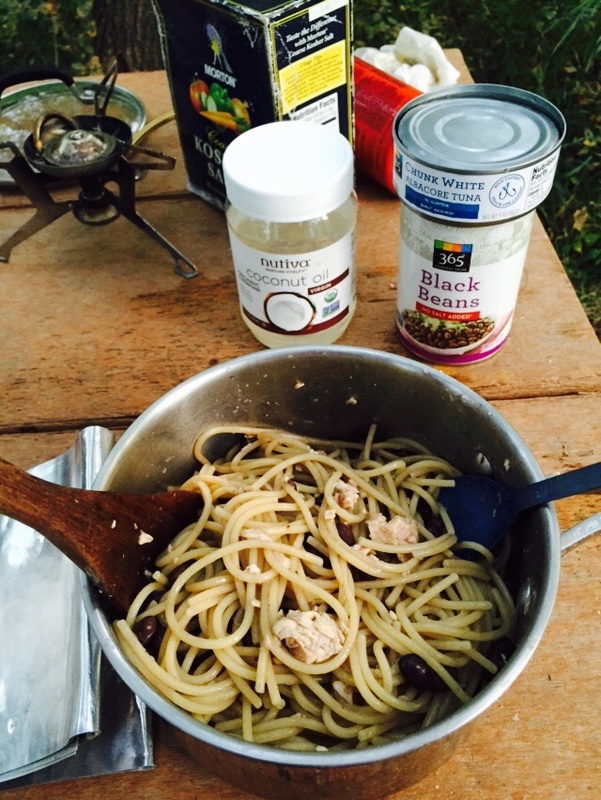 I cooked a simple but hearty dinner--spaghetti with black beans,canned tuna, and a crapload of coconut oil. 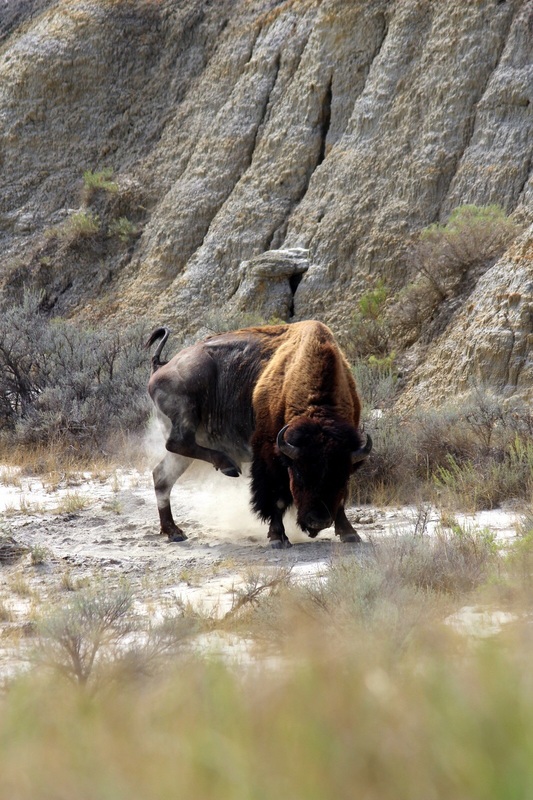 Next stop: Badlands National Park in South Dakota.